In a Nutshell: When Kohler Credit Union’s credit card portfolio switched over to Elan Financial Services in June 2018, its product selection also significantly increased. The organization now has a wide range of consumer and business credit cards that target financial priorities such as consolidating debt, building credit, earning cash back, and saving money on interest and expenses. And Kohler Credit Union can custom-fit members with the card that’s right for them. The credit union is celebrating 80 years of service to eight counties in Southeastern Wisconsin and has grown to 14 branches that each strives to bring financial literacy and credit solutions to their communities. When the member services representative at Kohler Credit Union’s main branch in Kohler, Wisconsin, sits down with new members to open an account, she often helps them apply for one of 12 Elan-issued credit card products at the same time. And it usually makes her day. “Our variety of credit card products means she can focus on what the member’s needs are and not just offer one card to everyone. She’s very excited about it and talks about it every single time she helps someone find the right card,” said Catherine Herzog, Assistant Branch Manager for the Howards Grove location. Having a wide range of credit cards to offer members is a fairly recent development at Kohler Credit Union. In June 2018 the processor that serviced Kohler’s credit cards sold its portfolio to Elan. As a result of the conversion, member credit card options have quadrupled. “With Elan, we went from having two cards for consumers to six, and from one card for business to six. They’re a strong range of products that help us narrow down and fit the right card to our members,” said Alaina Ackley, Electronic Services Coordinator. And Kohler Credit Union members are excited about the new options, too. Kohler Credit Union provides its members in Southeastern Wisconsin with plenty of credit card options. “Our new cardholders are pleased with the product options. One of the cards offers 0% interest for 15 months, and that’s helped some of our members through hard times over the summer. Some also have great rewards programs, so they’ve been very excited about their options,” Alaina said. By offering credit solutions for consumers and business owners at all stages of their financial journeys, Kohler Credit Union’s new Elan portfolio provides the community-oriented organization with more tools to help local members on their paths to financial security. The first in Kohler Credit Union’s powerful lineup of Elan credit cards for consumers is its MasterCard® Platinum Card, and its hallmark is an extended introductory interest rate of 0% for 15 months. With a current promotion running through December 2018, the 0% interest period is extended to 20 months, Alaina added. Any savings on interest during this time is non-deferred, meaning at the end of the 0% introductory period, cardholders will only pay interest on their current balance. This card is a good fit for members who want to consolidate high balances from other cards. It’s also a good option for those who want to avoid paying interest on large, one-time purchases that will take several months to pay back, such as household appliances or a home remodeling project. Kohler Credit Union members interested in earning rewards on their purchases can choose from three rewards cards. “When we present these, we ask members what interests them as part of a rewards program,” Alaina said. First, there’s the Cash Rewards American Express® Card, which allows cardholders to earn cash back based on their purchases. Each year, cardholders can earn 3% cash back on the first $6,000 in eligible gas station purchases, 2% on supermarket purchases, and 1% on all other eligible purchases. “This is for people who prefer to have money in their hands and their accounts. Maybe they do a lot of traveling, so the cash back on gas station purchases is a great perk for them,” Alaina said. Rather than percentage-based earnings, the World MasterCard® Real Rewards Card has a points system — 1.5 points monthly for every dollar spent — and more reward options. There’s no limit on the points cardholders can earn, and users have up to five years to redeem their rewards points for cash back, merchandise, gift cards, and even travel. The card has no annual fee, offers 0% APR for the first six billing cycles on purchases and balance transfers, and comes with an introductory bonus. Kohler Credit Union has card options for members who love to travel and those who prefer cash back, as well as for people trying to build their credit profile. “When they make their first purchase, they get 2,500 bonus points, which is equal to $25 cash back,” Alaina said. The Premier Rewards American Express® Card is Kohler Credit Union’s top-tier rewards credit card and has the most flexibility. Account holders can earn 4 points per dollar spent on restaurant purchases, 3 points per dollar on airline purchases, 2 points per dollar at gas stations, and 1 point for every dollar spent on all other eligible purchases. The card also awards 10,000 bonus points — equal to $100 cash back — to those who spend $1,000 in the first three months and has additional perks for travelers. “If they use it to pay for their Global Entry or TSA PreCheck, that fee is reimbursed by the company. There are also no international fees,” Alaina said. 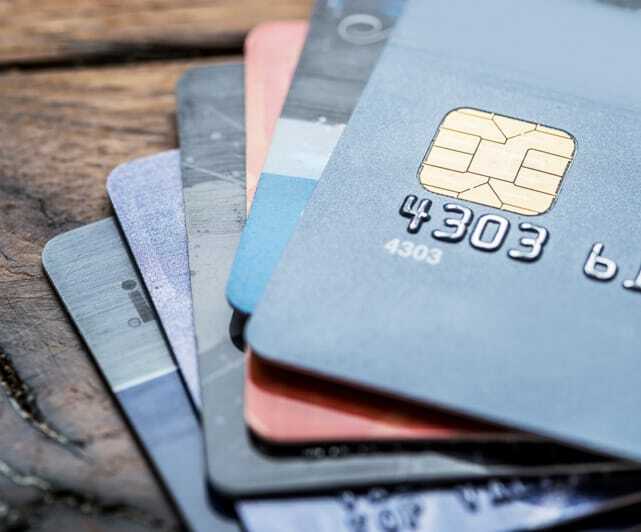 The other two cards in Kohler Credit Union’s consumer credit card portfolio are designed to help members who need to build — or rebuild — their credit. The World MasterCard® College Real Rewards Card offers the same benefits as the standard MasterCard Real Rewards Card and gives young adults the chance to start building good credit while earning cash back on their purchases. While applicants don’t have to be students, they must be at least 18 years old to apply. “We also offer a free credit score report for these members. It’s a good way for them to get used to credit and start monitoring their score,” Alaina said. The Secured Mastercard® has a maximum security deposit of $5,000 and requires members to open a savings account to secure it. A secured card is a good option for those who are just building their credit, but it’s also an option for consumers who are trying to improve their credit score but have difficulty qualifying for other cards. “It’s our way of helping them either rebuild their credit or earn that credit so we can provide them a better product,” Alaina said. Kohler Credit Union’s upgraded portfolio also includes six Elan credit cards designed for businesses. “Our business portfolio has grown over the years, and we have a department dedicated to serving their needs,” Alaina said. While many of these cards closely parallel the consumer versions, they’re equipped with business-specific features and benefits, including employee cards, free online reporting with spend analysis, and access to online workshops. Individual card features target the needs of business owners. The MasterCard® Business Card, which has the same introductory 15-month 0% interest rate as the MasterCard Platinum Card, is ideal for businesses that need to consolidate other card balances or make large purchases without paying extra interest. “It’s good for small business owners who might be starting out and building their inventory,” Catherine said. Business owners can apply for Kohler Credit Union cards that help them earn money on routine expenses. The three business rewards cards parallel consumer versions, but with rewards incentives built around common business expenses. With the MasterCard® Business Cash Card, owners earn an initial $25 cash back on their first purchase, up to 3% cash back on eligible net purchases from office supply stores, phone services, and internet and cable TV services, 2% on eligible net restaurant and gasoline expenditures, and 1% cash back on all other eligible net purchases. The MasterCard® Business Real Rewards Card closely parallel those of the consumer version, while the MasterCard® Business Rewards PLUS Card has a unique rewards system that accommodates the flexible nature of business expenses. “With the MasterCard® Business Rewards PLUS Card, you can earn up to 3 points per $1 on purchases in whichever category you spend the most on each month: cellular and phone services, hotels, or airlines. You earn 1.5 points for every $1 you spend on all other eligible purchases. There’s also a 20,000-points bonus after you spend $2,000 in the first 2.5 months, which is $200 cash back,” Catherine said. The final two specialty business credit cards include a secured card and a card for nonprofit organizations with an optional rewards program that allows them to earn 1 point for every dollar spent. Kohler Credit Union now offers a more diverse suite of credit cards to its members, but its team has always strived to teach people about responsible credit management — starting in each of its branches. “We provide a service called a wellness check where our members can sit down with our member service representatives and get the help they need with budgeting and what to do to improve their credit. Our representatives help them create a financial road map of where they want to be, and offer them products and services that can get them there,” Catherine said. 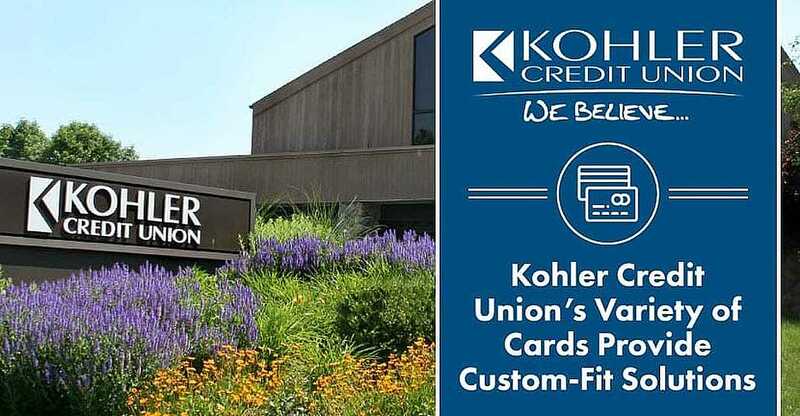 Kohler Credit Union, which was founded in 1938, has grown steadily over the past 80 years and now operates 14 branches that serve the Southeastern Wisconsin counties of Sheboygan, Calumet, Fond du Lac, Manitowoc, Milwaukee, Ozaukee, Washington, and Waukesha. Their branches are strategically located in high-traffic areas providing convenience to their members—including high schools and supermarkets. “We opened two branches this year, one of which was in a high school. That makes our fifth high school branch and an additional branch location in a local grocery store. We’re slated to open another branch in the Sheboygan Meijer next year,” said Laura Gabrielse, Senior Vice President of Communications & Community Development. Situated in centers of business and education, Kohler Credit Union also engages with the community through volunteer work as well as financial literacy programs. “We are strong proponents of financial literacy and have a team dedicated to community outreach programs. We’re out in schools, working with teachers and students to help kids understand positive saving habits and finances early in life,” Laura said. Kohler Credit Union’s stated mission is to “build relationships, strengthen communities, and fulfill dreams,” and to help support that mission, it values feedback from members. Earlier this year the credit union conducted focus groups to seek input on the member experience. “We received some great feedback from our members. They supported the strategies we’ve designed to fulfill their needs, and they’re appreciative,” Laura said. “Being on the senior management team, I can say that, when we’re thinking about strategy, product offering, or service offering, the needs and expectations of our members are at the forefront,” Laura said. With more credit solutions to meet the needs of consumers and businesses in many types of financial situations, Kohler Credit Union is fulfilling its mission and differentiating itself. “We tend to be one of the more competitive financial institutions in our area in terms of our rates, and we’re very proud of that. The fact that we have a wide range of cards means we can help very targeted demographics of our membership and give them a product that fulfills their specific needs — and that’s a huge benefit to our members,” Laura said. Kohler Credit Union membership is open to anyone who lives or works in Sheboygan, Calumet, Fond du Lac, Manitowoc, Milwaukee, Ozaukee, Washington or Waukesha counties, as well as his or her immediate family members and associations or organizations. Membership is required in order to enjoy the benefits, products, and services of Kohler Credit Union.